Could Microsoft be working on a foldable Surface tablet? Another patent from Microsoft has leaked online, this time apparently showing that the company is looking into ways of making a tablet with a foldable screen that can bend into the shape of a laptop. This patent shows how a traditional tablet-like device could be held vertically and folded, with the bottom half of the screen turning into a keyboard. It’s certainly an interesting take on the 2-in-1 form factor, however the patent also shows that the tablet would have a docking connector that would allow it to attach to a physical keyboard. 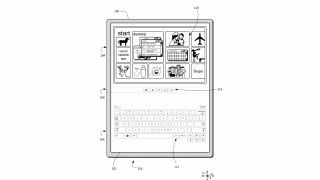 This would make it more like a traditional tablet/laptop hybrid, and the inclusion of a physical keyboard could make it more appealing for productivity uses. It goes on to suggest ways the operating system, which we assume would be Windows 10, could configure itself and the apps it is running, depending on if the device is in its folded configuration, flat configuration (like a tablet), or docked. The patent offers an exciting glimpse of what Microsoft could be planning for its future devices, however it’s worth remembering that many patents never make it past the initial planning stage. The patent in question was filed back in August 2016, and as we’ve yet to see any foldable tablets from Microsoft so far, it could mean that the Redmond company has been struggling with physically producing the technology. However, as MSPoweruser observes, some elements of the patent have ended up in real devices, such as the flexible hinge, which in the patent it to help prevent damage to the flexible screen, and has appeared in Microsoft’s Surface Book device (see below for a comparison). So, there is still hope that we could see the fruits of this patent in a future device from Microsoft. This follows another recent patent leak that shows how Microsoft is looking into how a possible Surface Phone could transform into a tiny laptop. At the very least, these new patents show Microsoft is looking at innovative ways to shake up traditional device designs.